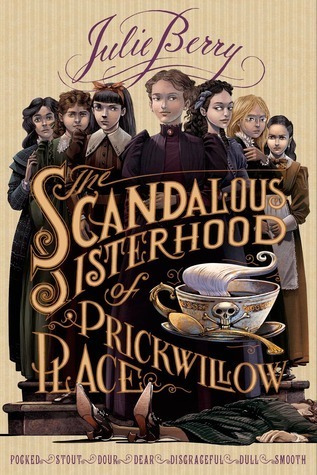 When their headmistress and her brother suddenly and mysteriously drop dead, the seven students of St. Etheldreda's School for Girls react unconventionally; they bury the bodies and pretend nothing happened. On the surface, this young adult book is an absurdist (in the best way possible) dark comedy about a group of girls making an unethical, illegal, and ultimately unsustainable decision to cover up a murder. However, it's the reason for this farce that is the most interesting. Each of these girls is underestimated by her family and doesn't quite fit into the position that Victorian life has laid out for her. By making this bid for freedom, the young women explore the possibility of a world in which they can reach their true potentials. This book won't be everyone's cup of tea. Literature has been focused on plausible plot lines for over a hundred years. We simply aren't accustomed to farces anymore. It may help to consider this book with respect to comedic theater. It's certainly not formatted as a play, but it reads like one and draws from theatrical tradition. While some readers may find it confusing, I love that there are seven distinct main characters who each contribute, according to their individual talents (for leadership, science, acting, etc. ), to avoiding detection and solving the murders. You aren't stuck with a single main character that you may or may not be able to relate to or worse, a bland heroine with no distinguishing characteristics to speak of. This book is suitable for a mature tween or older. The language is not difficult, and there's no adult content. It is, however, a murder mystery with some dark humor. It could be a good bridge ("my first murder mystery") between (non-murder) mysteries for children and adult mysteries, which are often focused on murder. The story could also be used as a jumping off point for a discussion on the limitations placed on women in Victorian England.